A non-volatile memory technology based on carbon nanotubes that's poised for commercialization in 2018 is expected to be more disruptive to enterprise storage, servers and consumer electronics than flash memory, according to a new report from BCC Research. "It is rare to see a technology catch fire after so long in development, but NRAM appears poised to do just that," said BCC Research editorial director Kevin Fitzgerald. "In fact, your next smartphone could be a carbon-based lifeform." The BCC report predicts the overall Nano RAM (NRAM) market will see a compound annual growth rate of 62.5% between 2018 and 2023, with the embedded systems market in which it will be used expected to grow from $4.7 million in 2018 to $217.6 million in 2023. That would represent a combined annual growth rate over those five years of 115.3%. Invented in 2001 by Woburn, Mass.-based Nantero Inc., NRAM is claimed to have 1,000 times the performance of DRAM but stores data like NAND flash memory; when the power is turned off, the data remains. For example, Ferroelectric RAM (FRAM) has already shipped in high volume; IBM has developed Racetrack Memory; Intel, IBM and Numonyx have all produced Phase-Change Memory (PCM); Magnetoresistive Random-Access Memory (MRAM) has been under development since the 1990s; Hewlett-Packard and Hynix have been developing ReRAM, also called Memristor; and Infineon Technologies has been working on Conductive-Bridging RAM (CBRAM). "These guys are in for a battle of holy war proportions," BCC Research’s senior editor and report co-author Chris Spivey said via email. "Each of these memories can be used in many different ways -- and so they will compete (eventually) across the board. And so as battles end only one will likely remain extant." In a published Q&A, Spivey said the most exciting aspect of NRAM is the movement from silicon to carbon-based memory, "which can evidently be carried out seamlessly on traditional CMOS foundries and also, it seems, even in logic foundries. This ushers in an era of potential mass customization." BCC Research agrees that NRAM has the potential for mass customization, meaning a chip can be optimized for many specific tasks. That will enable things like cheap, abundant autonomous IoT sensors as well as memory for the smartphone industry, embedded ASICS for automobiles and even headphones that store music intrinsically. "It has had a long history of high hopes that went undelivered till now," BCC Research said. "However, this report reveals to the public for the first time actual chip architecture. Coupled to licensing announcements anticipated (early) in the first quarter of 2017, the tide will turn precipitously." Over the past 16 years, NRAM has sputtered as it's attempted to catch on as a new memory technology. As early as 2003, for example, industry pundits were predicting it would challenge the memory market. In 2005, Nantero itself pronounced NRAM as a "universal memory" that would be in production the next year; the memory, however, remained in the engineering phase through 2009. BCC Research described NRAM's lengthy path to market as "a classic David versus Goliath adventure...only now David has successfully enlisted the help of one of Goliath's cousins, Fujitsu." NRAM market by memory application type. In August, Fujitsu Semiconductor Ltd. became the first manufacturer to announce it is mass producing the NRAM. Fujitsu plans to develop a custom embedded storage-class memory module using the DDR4 interface by the end of 2018, with the goal of expanding the product line-up into a stand-alone NRAM product family from Fujitsu's foundry, Mie Fujitsu Semiconductor Ltd.; the stand-alone memory module will be sold through resellers, who'll rebrand it. Using the DDR4 specification interface, NRAM could sport up to 3.2 billion data transfers per second or 2.4Gbps -- more than twice as fast as NAND flash. Natively, however, the NRAM's read/write capability is thousands of times faster than NAND flash, Greg Schmergel, CEO of Nantero, said. The bottleneck, therefore, is the computer BUS interface. "Nanotube switch [states] in picoseconds -- going off to on and on to off," Schmergel said in an earlier interview with Computerworld. A picosecond is one trillionth of a second. 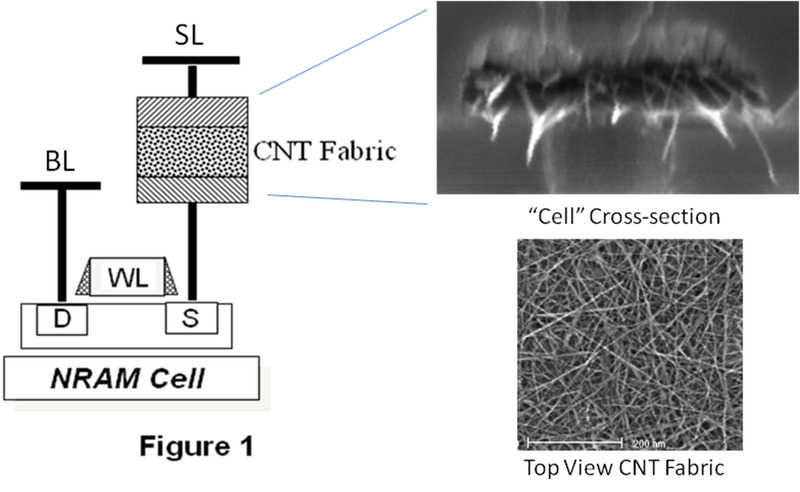 NRAM is made up of an interlocking fabric matrix of carbon nanotubes that can either be touching or slightly separated. Each NRAM "cell" or transistor comprises the network of the carbon nanotubes that exist between two metal electrodes. The memory acts the same way as other resistive non-volatile RAM technologies. "The combination of Nantero's technology with our design and production capabilities promises to meet the longstanding needs of our customers for non-volatile memory that is higher density, faster, more energy efficient and with a higher rewrite cycle," Masato Matsumiya, vice president of Fujitsu Semiconductor, said in a statement. NRAM has the potential to create memory that is vastly more dense that NAND flash, which is used today in thumb drives and solid-state drives. The densest NAND flash process today is near 15 nanometers, which refers to the size of the transistors used to store bits of data. NRAM can reach densities of below 5 nanometers, according to Schmergel. Fujitsu plans to initially manufacture the NRAM using a 55-nanometer (nm) process. At that size, the initial memory modules will only be able to store megabytes of data. However, the company also plans a next-generation 40nm-process NRAM version, Schmergel said. Another big advantage NRAM has over traditional NAND flash is its resistance to heat. It can withstand up to 300 degrees Celsius. Nantero claims its memory can last thousands of years at 85 degrees Celcius and has been tested at 300 degrees Celsius for 10 years. Not one bit of data was lost. In December, Nantero received an additional $21 million in venture funding, bringing its total to $110 million, "solidifying our hunch that this technology is about to break into the open," Fitzgerald said in the report. 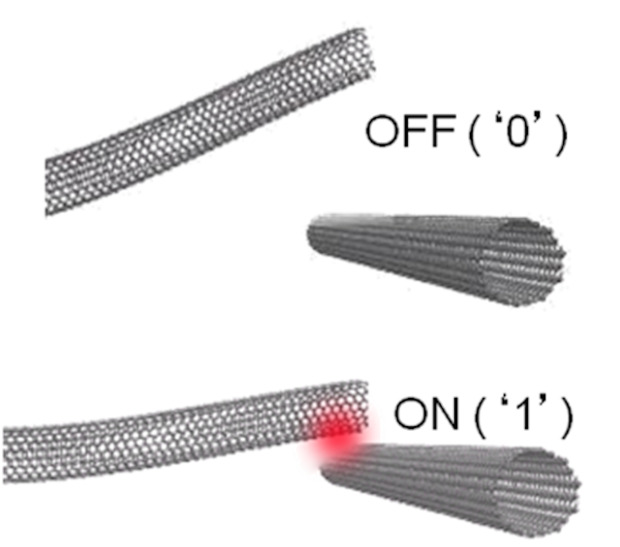 An illustration of the two states of NRAM, where one carbon nanotube touches another, creating a low reisistance or "on" state or where the tubes don't touch, creating a high resistance "off" state. Unlike recent announcements by Intel and development partner Micron of their 3D XPoint non-volatile memory, which uses the PCIe/NVMe motherboard interface, NRAM uses DDR4 DRAM interface. Spivey said he was somewhat surprised that Nantero's memory will initially keep the DRAM interface. "It seems to me a bit timid. That means there will be combinations of different types of memory used for quite a while, and certainly that is Fujitsu's direct intention," Spivey stated in an email reply to Computerworld. Even so, BCC Research expects NRAM to quickly affect consumer electronics, mobile computing, the Internet of Things, enterprise storage, defense, aeronautics and automotive. Others agree. "This is one of very few technologies that's moved beyond the research lab into high-volume manufacturing CMOS facilities," Gregory Wong, an analyst with Forward Insights said in an earlier statement. "NRAM's unique combination of high speed and high endurance has the potential to enable innovative products in a host of consumer and enterprise applications."